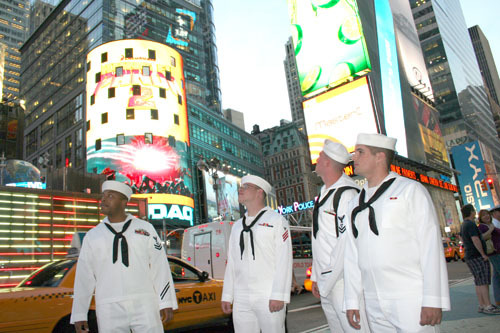 Fleet Week New York, now in its 26th year, is the city’s time-honored celebration of the sea services. It is an unparalleled opportunity for the citizens of New York and the surrounding tri-state area to meet Sailors, Marines and Coast Guardsmen, as well as witness firsthand the latest capabilities of today’s maritime services. The week-long celebration has been held nearly every year since 1984. It is anticipated that nearly 1,500 Sailors, Marines and Coast Guardsmen will participate. 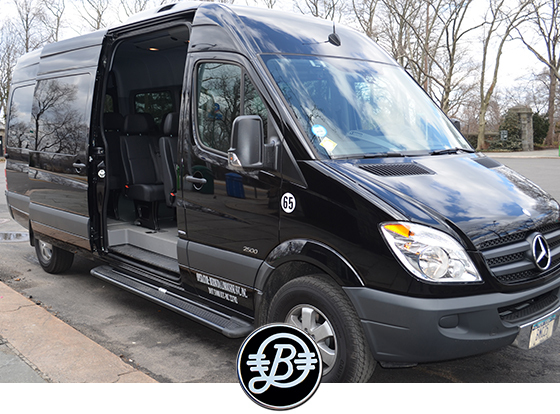 This Memorial Day Weekend why not use one of our sprinters and bring the entire family to the events. Our reservation agents are ready to assist you and our chauffeurs will deliver the finest level of service. Lines may be capped at 3 p.m.
Ship tours will be held during the week at Pier 92 in Manhattan and The Sullivans Pier in Staten Island. Tours will be conducted daily. Event is free and open to the public. USO, along with volunteers, will build bikes. Bikes will be assembled and given to service members participating in Fleet Week New York for their children. A combined team of members from the U.S. Navy Explosive Ordnance Disposal (EOD) team and Helicopter Sea Combat Squadron Five (HSC-5) will present a mine countermeasures demonstration. The demonstration will show how a five-member EOD team can be inserted via a helicopter into a remote area. After the air demonstration, the two MH-60S helicopters will land and be available for display. Navy Band Northeast “Rhode Island Sound” will be performing live. Not Open To General Public. Time: Noon – 12:30 p.m.
U.S. Coast Guard Silent Drill Team will perform on the street outside the front entrance to the NY Stock Exchange. Event is free and open to the public. U.S. Marine Corps (USMC)aerial demonstration will showcase the latest capabilities of the USMC for school faculty, students and their families. Not Open To General Public. Time: 3:30 p.m. – 9 p.m.
USO, in partnership with PepsiCo, will host a basketball tournament for participating units of Fleet Week and teams from New York City Police Department (NYPD), Fire Department City of New York (FDNY) and Port Authority Police Department (PAPD). Parade route will run from Chatsworth Ave. to Palmer Ave. to Larchmont Ave. ending at Village Hall for the Memorial Day Ceremony. Navy Band Northeast “Marching Band” will perform. Time: 7:10 p.m. – 10 p.m.
New York Mets will take on the Los Angeles Dodgers. A service member from the U.S. Marine Corps will participate in the New York Mets “Veteran of the Game” program. U.S. Marine Corps (USMC) aerial demonstration will showcase the latest capabilities of the USMC for school faculty, students and their families. Not Open To General Public. A combined team of members from the U.S. Navy EOD team and Helicopter Sea Combat Squadron Five (HSC-5) will present a mine countermeasures demonstration. The demonstration will show how a five-member EOD team can be inserted via a helicopter into a remote area. After the air demonstration, the two MH-60S helicopters will land and be available for display. Navy Band Northeast “Rhode Island Sound” will be performing live. Not Open To General Public. U.S. Coast Guard will conduct a Search and Rescue demonstration in the water off of Coney Island for visitors to see. Event is free and open to the public. U.S. Coast Guard Silent Drill Team will perform on Pier 86 at the Intrepid Sea, Air & Space Museum. Event is free and open to the public. U.S. Marine Corps MAGTF helo demonstration at Orchard Beach Park in Bronx, New York. Event is free and open to the public. Time: 2 p.m. – 2:30 p.m.
Joint re-enlistment and promotion ceremony will take place on the plaza at the 9/11 Memorial. Northeast Navy Showband and U.S. Fleet Forces “Brass Band” will perform concerts in Herald Square (Macy’s). U.S. Coast Guard (USCG) Drill Team will also perform. Line-up: USCG Drill Team – 5:30 p.m.-6 p.m. and 6:30-7 p.m.; U.S. Fleet Forces “Brass Band” – 6 p.m.-6:30 p.m.; Northeast Navy Showband – 7 p.m.-8 p.m. Event is free and open to the public. Time: 7:30 p.m. Doors open at 6:30 p.m.
A night of music and multi-media entertainment featuring New York-based vocalist/songwriter Marcus Goldhaber and his 6-piece band. New York Mets will take on the Arizona Diamondbacks. A service member from USS McFaul (DDG 74) will participate in the New York Mets “Veteran of the Game” program. U.S. Marine Corps and U.S. Navy will display aviation and operational equipment. A combined team of members from the U.S. Navy EOD team and Helicopter Sea Combat Squadron Five (HSC-5) will present a mine countermeasures demonstration. The demonstration will show how a five-member EOD team can be inserted via a helicopter into a remote area. After the air demonstration, the two MH-60S helicopters will land and be available for display. U.S. Navy Band Northeast “Brass Band” will perform. Event is free and open to the public. U.S. Coast Guard will conduct a Search and Rescue demonstration in the water off The Sullivans Pier for visitors to see. Event is free and open to the public. The Staten Island Fleet Week Committee will host a Music Festival at the pier. Festival will feature local musicians will be performing for ship visitors. Navy Band Northeast’s “Brass Band” will perform. New York Mets will take on the Arizona Diamondbacks. A service member from U.S. Marine Corps will participate in the New York Mets “Veteran of the Game” program. A combined team of members from the U.S. Navy EOD team and Helicopter Sea Combat Squadron Five (HSC-5) will present a mine countermeasures demonstration. The demonstration will show how a five-member EOD team can be inserted via a helicopter into a remote area. After the air demonstration, the two MH-60S helicopters will land and be available for display. Event is free and open to the public. U.S. Coast Guard will conduct a Search and Rescue demonstration in the water off of Pier 92 for visitors to see. Event is free and open to the public. The Staten Island Fleet Week Committee will host a Music Festival at the pier. Festival will feature local musicians will be performing for ship visitors. U.S. Coast Guard Silent Drill Team will perform at the New York Aquarium. Event is free and open to the public. Service members will walk in parade, beginning at 1 p.m., followed by short service/wreath-laying ceremony. Service members to participate in the parade, hosted by the Village of Hastings-on-Hudson Fire Department. Time: 1:10 p.m. – 4 p.m.
New York Mets will take on the Arizona Diamondbacks. A service member from USS Cole (DDG 67) will participate in the New York Mets “Veteran of the Game” program. Service members to participate in the annual Memorial Day parade, hosted by the Citizens of College Point. U.S. Marine Corps MAGTF helo demonstration at Rye Playland in Rye, New York.Event is free and open to the public. Navy Band Northeast “Rock Band” will perform a concert at Pedestrian Plaza at 42/43 Streets in Manhattan, New York. U.S. Coast Guard Silent Drill Team will perform. Line-up: USCG Drill Team – 4:30 p.m.-5 p.m.; Navy Band Northeast “Rock Band” – 5 p.m.-6:15 p.m. Event is free and open to the public. Service members to participate in the 147th Kings County Memorial Day Parade. American Legion Post #1285 will host the Bayville Memorial Day Parade. Event includes memorial service and wreath-laying followed by parade. More than 20 veterans organizations expected to participate at the The Soldiers and Sailors Monument. This year’s ceremony will commemorate the 150th anniversary of the Gettysburg address. Service members to participate in one mile walk in the Town parade from Pelham Manor to the business district of Pelham, a formal Memorial Day ceremony honoring Pelham’s 88 residents killed during military service. American Legion Post #117 in Bogota, New Jersey will host annual Memorial Day Service and Parade. Service members to participate in annual parade. Intrepid Sea, Air & Space Museum will honor the men and women who made the ultimate sacrifice while serving in the United States Armed Forces by at the annual Memorial Day Ceremony. U.S. Coast Guard will conduct a Search and Rescue demonstration in the vicinity of the water off of Pier 86 for visitors to see. Event is free and open to the public. New York Mets and the USO of New York will host the annual Military Appreciation Day. Mets will take on the Pittsburgh Pirates. Events will include: first pitch from U.S. Navy, U.S. Marine Corps and U.S. Coast Guard service members; re-enlistment; enlistment; Field of Dreams; National Anthem; Joint Service Color Guard; a service member from the U.S Coast Guard will participate in the New York Mets “Veteran of the Game” program; and more! U.S. Marine Corps MAGTF helo demonstration at Hudson Park in New Rochelle, New York. Event is free and open to the public. The Little-Neck Douglaston will host annual Memorial Day Parade. Parade begins at 2 p.m. and spans a more than 1 mile along Northern Blvd. in Queens, New York. American Legion Post #156 will host annual Memorial Day Parade. U.S. Navy ships will depart Pier 92 in Manhattan and The Sullivans Pier in Staten Island. Event is free and open to the public. A combined team of members from the U.S. Navy EOD team and Helicopter Sea Combat Squadron Five (HSC-5) will present a mine countermeasures demonstration. The demonstration will show how a five-member EOD team can be inserted via a helicopter into a remote area. After the air demonstration, the two MH-60S helicopters will land and be available for display. Not Open To General Public. Looking to tour the city, take that special someone to a broadway show? Bermuda Limousine can help you make that evening memorable. Simply reserve our 4 hour special and let our professional chauffeur do the driving.